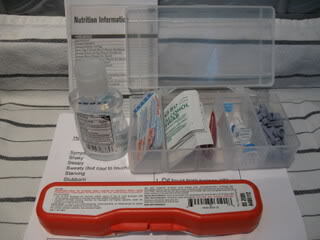 Lancets, Test Strips, and Syringes, Oh My! There are so many items that we use over and over, four times a day or more. To keep them at hand, I have them organized into a craft box. This box, our Novolog Jr. pen, log book, notebook, and Calorie King book sit on the kitchen counter. 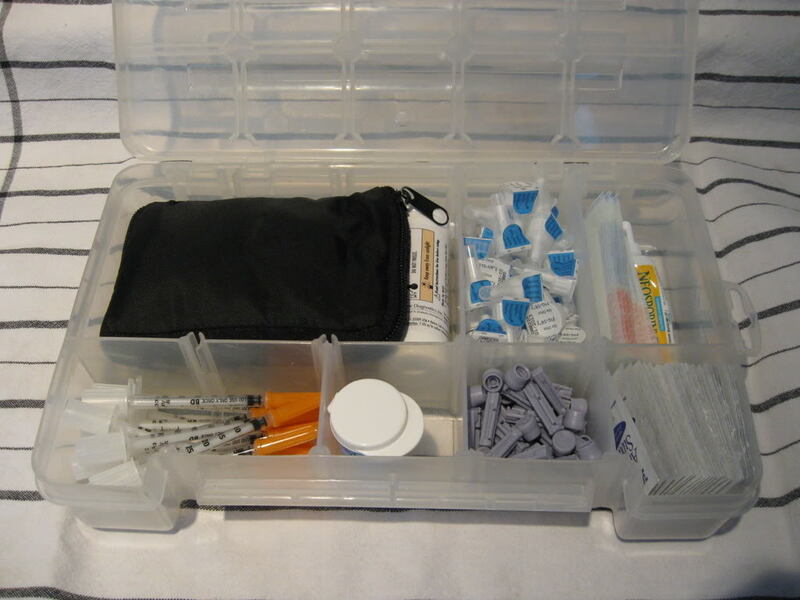 In the box we have the glucose monitor, calculator, ketone strips, pen needles, Band-Aids, Neosporin, syringes, test strips, lancets, and alcohol swabs. 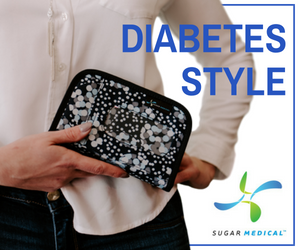 We test blood glucose levels four times a day. This requires a lancet and test strip. For meal time injections, we use an alcohol swab and pen needle. The long lasting injection at bedtime is given with a syringe and we use an alcohol swab to clean the vial. Here is the glucose meter. 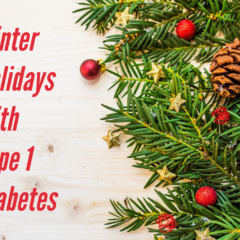 There are about 20 individual steps to test blood sugar levels. Basically, we wash hands (we don’t use alcohol to clean the finger first because it can be drying), insert a lancet and get the test strip ready, poke the finger, and apply a drop of blood to the test strip which was placed into the meter. As you can imagine, there is a lot of waste. Some things, like the alcohol swabs, can be placed in the trash. Others can’t. 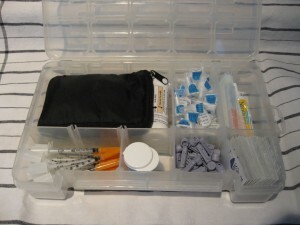 Sharps containers are expensive to purchase, fill quickly, and there isn’t a place that will take them. 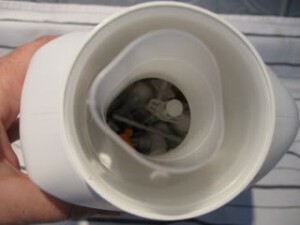 The alternative is to use a bottle with a screw top and place used needles in sharp end first. We save our empty detergent bottles for this use. 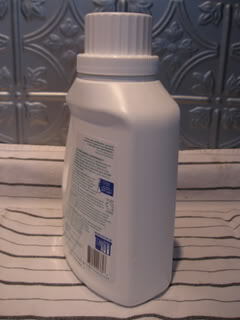 We place lancets, pen needles, and syringes into the detergent bottles. When it is full, it is placed in the regular trash. When leaving the house, there is a set of supplies that we must carry with us. We have a small soft lunchbox to keep all the supplies. 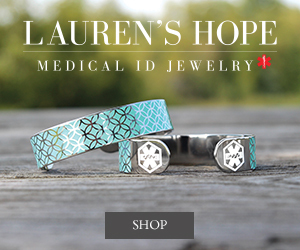 Hooked to the top is a medic alert bracelet. We still need to order a bracelet that has her information engraved on it. 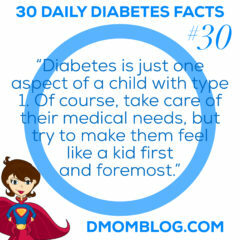 Additionally, we have to carry water since it’s important for diabetics to have access to water at all times. 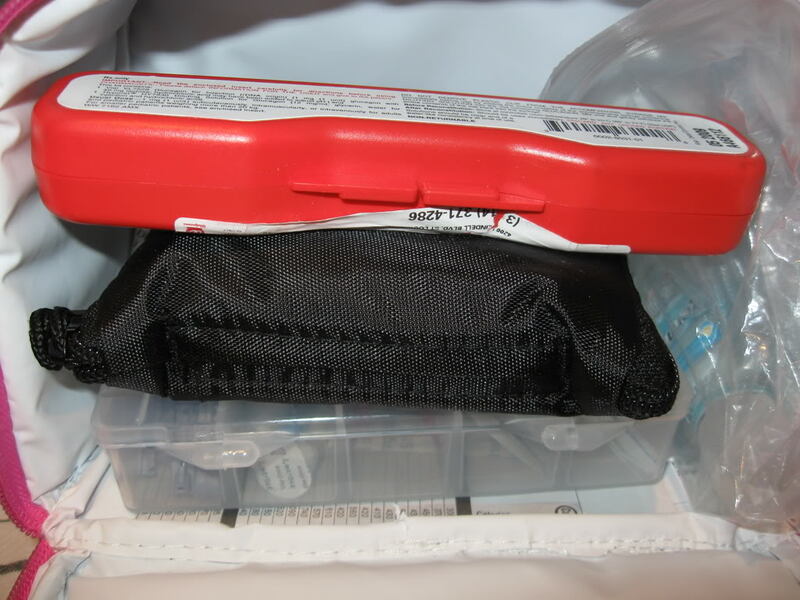 This one has a zippered compartment underneath with a small plastic box. In the box we keep emergency supplies in case she is going low. 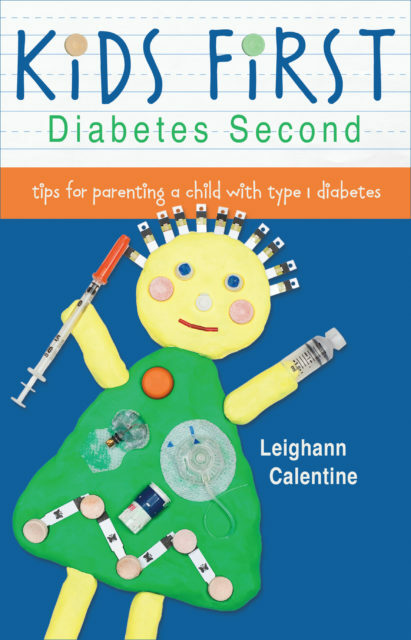 These include an info sheet with the signs of hypoglycemia and how to treat it and emergency instructions in case she goes so low that she becomes unconscious or has convulsions. All of the emergency foods equal 15 grams of carbs and the choice varies depending on how low and how coherent she is. 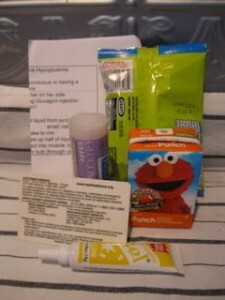 Snack pack, juice box, glucose tablets (3 tablets=15 g carbs), cake icing gel (if someone is very low and not really with it, but not unconscious, you can squirt cake icing gel into their cheek and massage it to get them to swallow it). In the top part of the lunchbox we keep glucagon (emergency glucose that is injected if she is unconscious or convulsing; 911 is also called at that point), a small box with supplies (lancets, pen needles, alcohol swabs, Band-Aids, sugar-free drink mix that can be added to a bottle of water for flavor), alcohol hand sanitizer, nutrition info for a few restaurants. There you have it…the supplies we use daily and what we have to carry with us every where we go. I haven’t even shown you the large box that has all of the supplies that we use and all of the prescriptions. Just wanted to say that I love this post. When we were just starting out four months ago, I was so baffled by all of the supplies we needed and how to store them, but I couldn’t find much in the way of organization tips. We’ve got a system now, but it gets revised often. 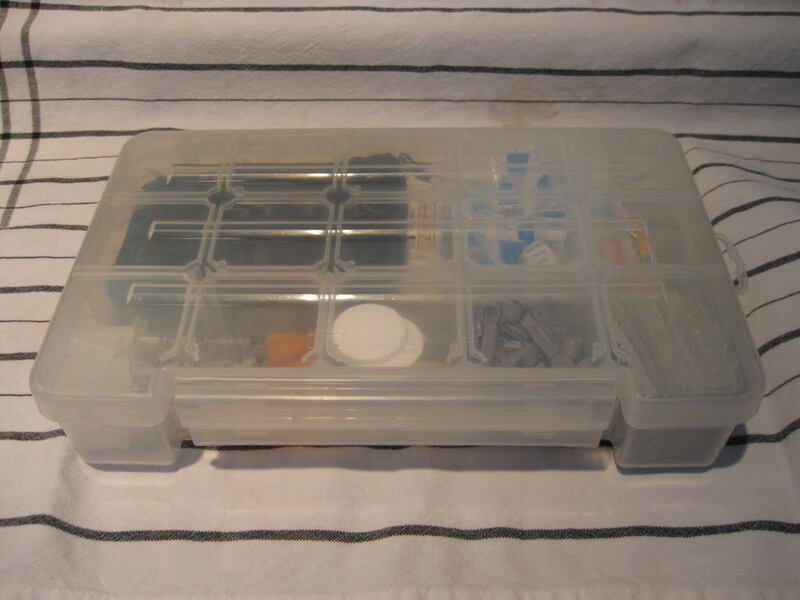 I really like the idea of the craft boxes with dividers. We have a drawer in our kitchen with organizers in it for the stuff we use daily, like the testing supplies, syringes, calculator, food scale, etc. I have a separate test kit and zippered bag I carry in my (enormous) bag when we aren’t at home. Jessica- It’s crazy the amount of “stuff” we all need on a daily basis to manage this! Since we began pumping, the bag we carry with us everywhere has actually gotten smaller, thankfully. I’ve been meaning to do a post with what we carry now. The every day stuff at home is about the same. 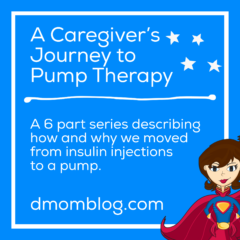 We used to use an insulin pen for meals (don’t need those any more) and syringes at bedtime (keep those if you ever have high BG’s that won’t come down and you need to give insulin by syringe). But we used to bring along a big tote bag. Now her “pump bag” is a purse we got at Target that is small and has several pockets. 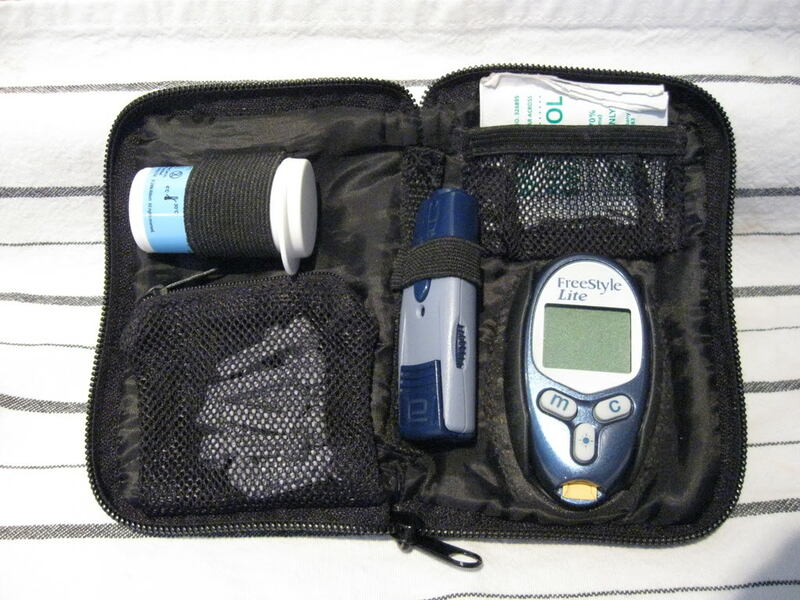 It holds her PDM & Glucagon in the big section. A zippered part has an extra pod. 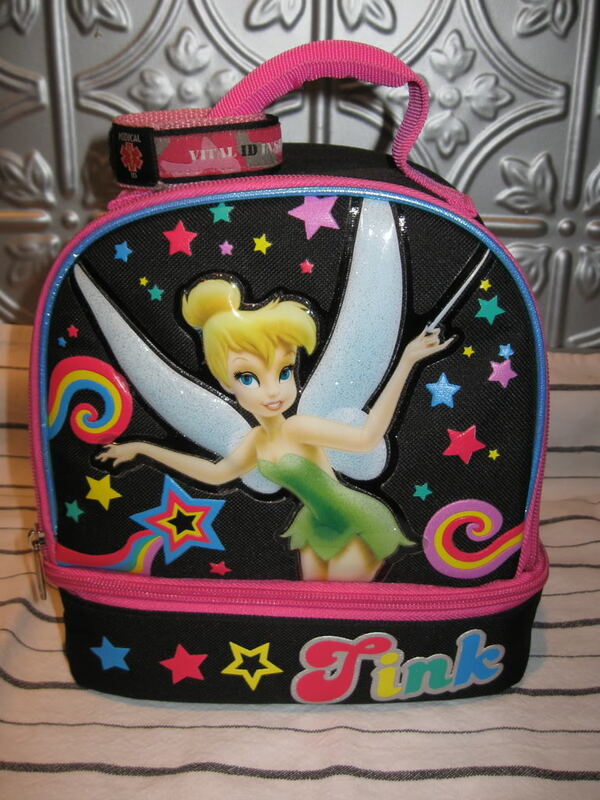 And the front pouch has a juice box, Smarties, and cake icing gel. One you get the PDM and it’s case, take it with you to someplace that has more boyish bags, maybe a camping or sporting goods store, and look for a bag he can carry. Maybe even a fanny pack. 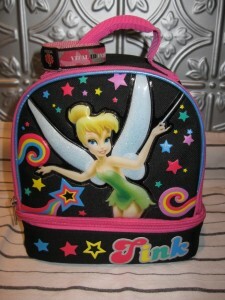 My daughter carries her bag across her chest or over her shoulder and hands it off to her teacher at school. And yay for starting the pump!